The 2019 Audi A8 luxury sedan was unveiled at the Audi Summit in Barcelona this past July. Just a few hundred kilometres down the road in Valencia, we finally got the opportunity to drive the car for the first time. 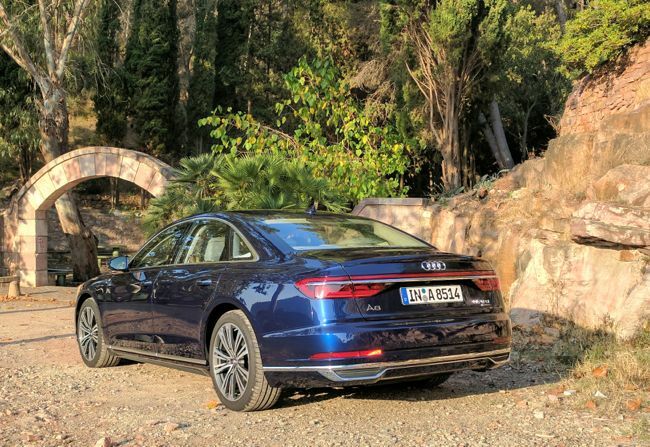 The back story to this all new A8 is the revision of the Audi Space Frame, which has been tweaked away from an all aluminum composition to one that incorporates a number of interesting alloys and hybrid metals to deliver a lighter, stronger frame. Added to the lighter body, Audi has infused a number of new technologies including varying levels of autonomous driving, further safety enhancements and luxury features. Audi says the A8 is the first Level 3 capable autonomous driving vehicle. The distinction between Level 2 and Level 3 being the ability for the driver to operate the vehicle without his or her hands on the steering wheel. In reality a very small number of jurisdictions around the globe permit Level 3 autonomous driving, but Audi has built the A8 in preparation for what they see as the inevitability of autonomous driving becoming the norm. 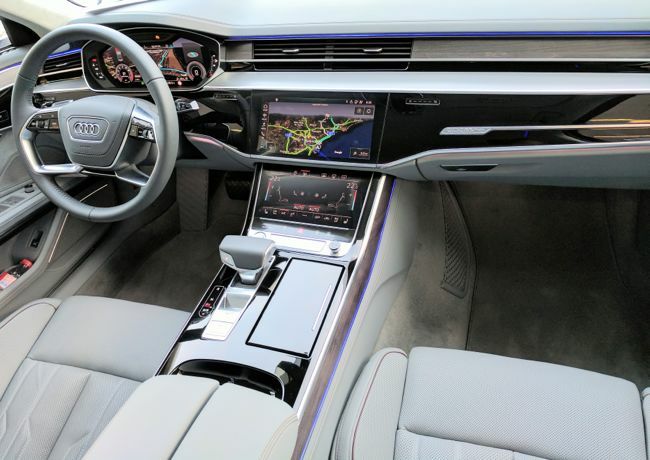 Engineers say that the A8 has been designed with both the mechanical and software redundancies, similar to an aviation environment, required for true Level 3 autonomous driving. 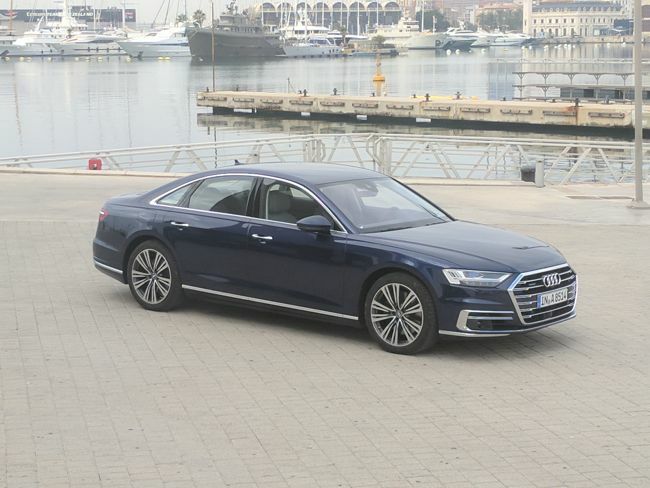 The new Audi A8 is lighter than the outgoing model and comes with more powerful, yet more fuel efficient engines. In Canada, all Audi A8s will only come as the long wheelbase A8L and all will have a mild hybrid power train. The system utilizes a belt/alternator starter system combines the alternator and starter into one unit that connects to the drivetrain via a serpentine belt. The starter function turns the crankshaft on the engine. Once running, the belt turns the alternator to produce power, which is sent to the onboard battery. Added benefits of the combined system include saving up to 0.7 litres per hundred kilometres of driving, faster restarts for the start/stop system, as well extra pull off the start-line with the starter/alternator being able to contribute up to 16 hp and 44 lb.-ft. of torque. The gasoline engines fitted in the cars coming to Canada include a 3.0L TFSI engine producing 340 hp as well as a 4.0L V8 rated at 440 hp and 487 lb.-ft. Performance obviously has been raised with these more powerful engines fitted in lighter vehicles. 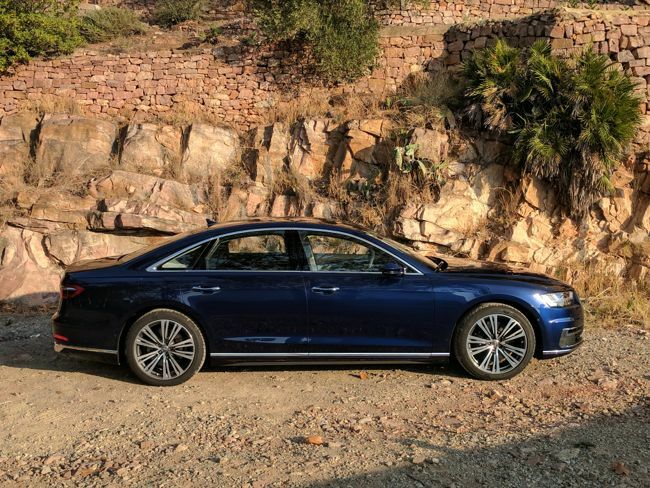 The 3.0L engine will spirit the A8 from rest to 100 km/h in 5.6 seconds — performance numbers of V8 engine were not available at the time of the press conference. Audi has also revised the model naming by adding a numerical ranking of sorts. The 3.0L V6 is now called the A8 55 TFSI, while the 4.0L V8 has been renamed the A8 60 TFSI. The new A8’s cabin is dominated by a sweeping vista of black glass-like sheen across the dashboard. The centre point of the dash is occupied by a pair of capacitive black glass screens. The larger top screen controls the next generation MMI system. Switches and dials has mostly been replaced by functions layered into this screen. Of the controls left as stand alone functions, all have been transformed into electronic touch controls, all except for the most logical use of an analog control — the audio volume control. Bravo to the Audi designers for this dose of common sense. Driving the all new Audi A8 55 TFSI, with the V6 up into the hills surrounding Valencia proved to be more enlightening than originally thought. As we climbed up out of the city limits we began encountering legions of Spanish cyclists. Yes, its the national sport, but you cannot imagine the number of people out pedalling through the hillsides, even on a typical work day. Add to that, the narrow ribbons of pavement with sharp drop offs into culverts, led to some cautious driving. Despite the visually daunting size of the 2019 Audi A8, the car dances a fine line. The all wheel drive Quattro handling is enhanced with the new all-wheel-steering, as well as the new A8’s active suspension. The system uses electric motors at each wheel to control roll and pitch. Depending on the Drive Select setting the car can either smooth out road imperfections in comfort mode, or cancel out body roll and sharpen the suspension response in Dynamic setting. The system also makes use of the forward facing onboard camera to precondition the vehicle for road imperfections that are in the vehicle’s path. Combined with the Audi Pre-Sense safety system, the active suspension system will also raise the car up by eight centimetres if the sensors detect an impending side collision. While threading between the oncoming cars, cyclists going either direction we were lulled out of our complacent routine by the jarring chime and braking of the Audi presense safety system. The onboard camera and radar sensors had detected an oncoming vehicle, as well as two cyclists trying to pull into the roadway from either side. Eventually, the cyclists stopped after seeing both vehicles, but the Audi’s on-board systems had recognized the hazard and reacted first. Performance from the V6 equipped model was wonderful and should satisfy most consumers. However a brief stint in the V8 model proved the elevated performance. We estimate the 0-100 km/h time should be about a second faster than the V6 engine. The V8 also adds more throaty noises to the mix. 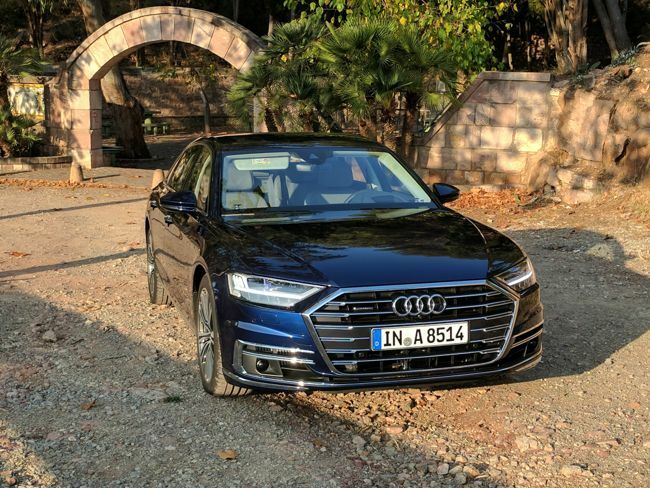 Despite the intrusion into our test drive in the A8, the net result of four years of engineering and testing to bring the 2019 Audi A8 to market has to be seen as a resounding success. 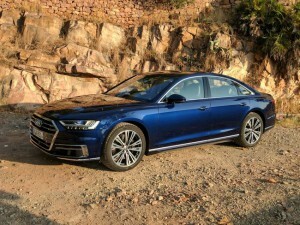 The level of comfort, performance, technology and safety built into Audi’s flagship sedan has now set a high-water benchmark for what the market expects from a luxury sedan. The all-new 2019 Audi A8L will come to the Canadian market in the third quarter of 2018 and prices have yet to be finalized.